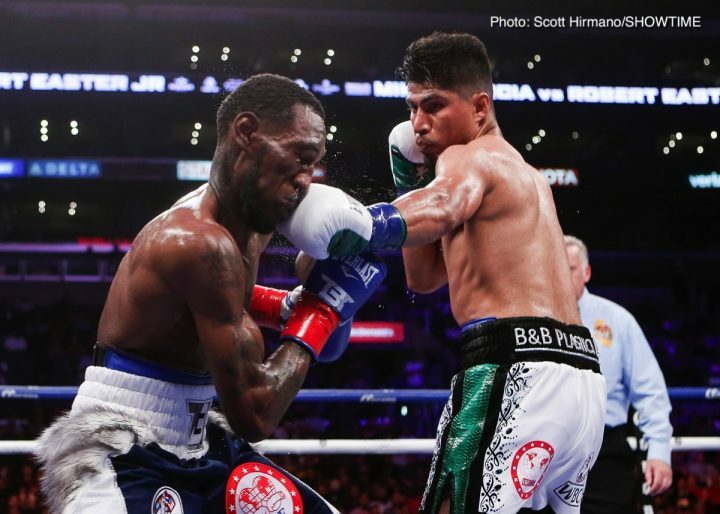 By Jim Dower: Mikey Garcia says he’s interested in a fight against WBA World welterweight champion Manny Pacquiao, but his main goal is to challenge IBF 147 pound champion Errol Spence Jr. However, the chance of a fight with the unbeaten Spence (24-0, 21 KOs) may need to wait for Garcia until 2019, as the heavyweight clash between WBC champ Deontay Wilder and former champion Tyson Fury will likely take place first on Showtime later this year. Mikey might come undone against a fighter like Pacquiao. That’s a big step up for Mikey from his recent fights against Robert Easter Jr., Sergey Lipinets and Adrien Broner. Pacquiao has a lot of hand speed, punching power and experience at 147. Mikey hasn’t fought anyone with that combination of assets since he moved up in weight. It might be a step too far for Garcia to face someone that good in his first fight at welterweight. It would be much worse for Mikey to face IBF 147 pound champion Errol Spence Jr. in his first fight at welterweight, but that’s what he wants. There’s less fallout for Mikey in losing to Spence than there would be in absorbing a loss to 39-year-old Pacquiao or lightweight champion Vasyl Lomachenko. It’s a smart move for Mikey to face Pacquiao if he wants the money though. A fight between Mikey and Pacquiao would likely attract more attention worldwide than a fight against Spence. It’s a little early for Mikey to face Spence right now. Mikey is 30-years-old now, and he’s in the prime of his career. It works against him to wait too much longer before he faces Spence, because he’ll soon be too old to have any chance of beating him. Pacquiao (60-7-2, 39 KOs) and Mikey (39-0, 30 KOs) is a fight that potentially be made in 2018, especially if the two of them sign with Matchroom Boxing USA promoter Eddie Hearn. He wants to put them on DAZN for U.S fans. Hearn is also interested in putting together a fight between Amir Khan and Pacquiao for later this year. That’s a fight that has a good chance of being made if Hearn can find enough money to make it worthwhile for Pacquiao to take the fight. Pacquiao would be the more winnable fight for Mikey than a fight against the bigger, stronger Spence. Mikey thinks he can beat the 28-year-old Spence, but he’s pretty much alone with that belief. The boxing public doesn’t give Mikey much of any chance of defeating Spence based on how he looked in his recent fights against Robert Easter Jr., Sergey Lipinets and Adrien Broner. Mikey won all three fights, but he wasn’t completely dominating in doing it, and he wasn’t able to knockout any of those guys. Against Lipinets and Easter, Garcia took punishment in winning the fights. He was clearly the better fighter in those matches, but they weren’t easy matches for him. Spence would likely annihilate Broner, Lipinets and Easter without too many problems. ”(Spence) is the biggest challenge, the most dangerous fight maybe for me, but I feel capable, I feel comfortable, strong, fast, intelligent, experienced, I think I beat him,” Mikey said. Garcia’s trainer/brother Robert Easter doesn’t like the Spence fight for him. He wants him to face WBA lightweight champion Vasyl Lomachenko next, and then Pacquiao after that. However, for Mikey to take the fight with Lomachenko, he’ll need to wait until 2019, as the Ukrainian fighter is facing newly crowned World Boxing Organization lightweight champion Jose Pedraza on December 1 on ESPN+. That’s the fight that Lomachenko’s promoters at Top Rank want for him to take next, because it would give him an easier fight and would give him the chance to add another belt at lightweight to his collection. Lomachenko’s goal is to capture all the titles at 135. Mikey has two of them in holding down the IBF and WBC lightweight titles, and Lomachenko has the WBA and Pedraza the WBO. If Lomachenko beats Pedraza, he’ll have the WBA and WBO belts, and he’ll only need the fight with Mikey to unify the lightweight division.